Radon Centres Ltd are an approved member fo the Radon Council, with over 25 years experience within the market sector. We offer mitigation advice & installation services to reduce high radon levels within your home. We will ask you for further information regarding your property & arrange an initial site survey with our Mitigation Manager. An external radon system is the most effective reduction method to reduce radon levels, a radon fan will be attached to draw the radon from under the property and disperse it into the atmosphere, thus reducing the radon levels inside the home. To reduce radon levels in houses with a suspended floor & radon concentration levels slightly above the action level, additional air bricks can be installed to increase ventilation under the property. However, alternative work will be required if this work is not effective. A Positive pressure system is suitable for radon levels below 500 Bq/m³. A loft mounted system which is designed to change the air pressure in your house by blowing air in from the loft (heated systems are available to preheat air before it passes into the home) thus diluting the radon within the home. The vent is usually located within the landing area of a domestic property. 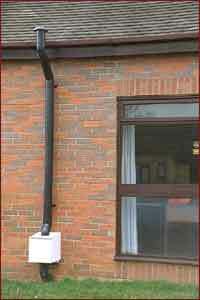 Advantages of this system is its economical to run & also reduces condensation.